says they are going big with a one-of-a-kind church service with a record-number of people under one roof. The University of Phoenix Stadium holds 65-thousand seats and at least 55-thousand people are expected to attend. Foreman promises huge surprises for all the kids and lots of fun on top of the service. In fact, just like a Cardinals football game, there will be Easter Tailgating available. Plus, all guests will be given special gifts and treats at their seats. 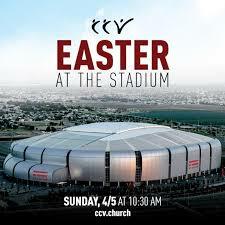 Gates open at 8 a.m. for Easter Tailgating with Easter Services beginning at 10:30 a.m. And it’s Free.